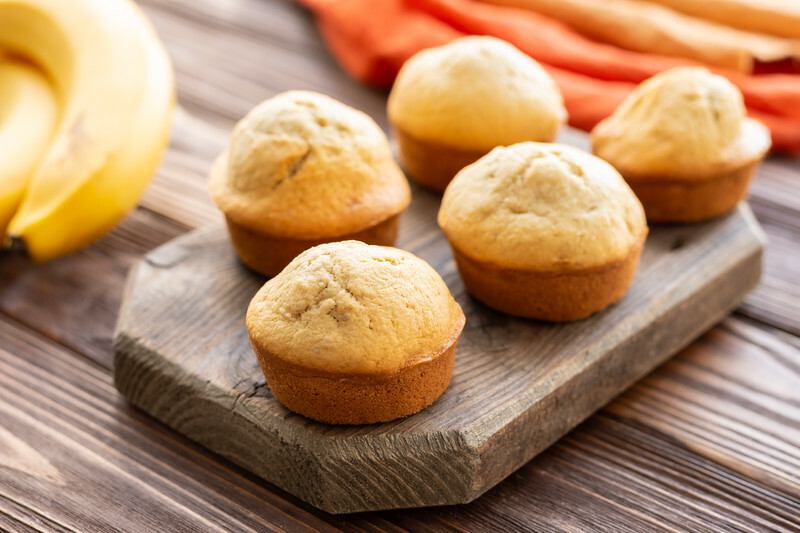 Easy banana muffins made from just five ingredients, ready in less than 30 minutes! Welcome to your new favorite banana recipe. Out of all the many many recipes in my towering pile of books and binders and scraps of paper, these banana muffins are the ones the Southern daughter requests the most. And conveniently, it’s also one that I am most happy to make whenever she asks, because they are fast and fabulous…only 5 ingredients that pretty much just get mixed together and baked, and twenty minutes later you have light and perfect muffins that have just the right amount of banana flavor. They are also the world’s best way of using up these. Ready to rock your world, banana-wise? Let’s make them! Yep, we’ve all been there. We buy a nice big bunch of bananas, fully intending to eat them all, and then you turn around and they have the dreaded brown spots all over them and nobody wants to touch them with a ten foot pole. When this happens, you pretty much HAVE to make banana muffins. It’s the only way out. So! Here’s what you need: Three mushy bananas, an egg, a little bit of vegetable oil, some sugar, and one of my personal favorite baking ingredients, Bisquick. Yep, I love Bisquick. I do. I always have it around just in case someone has an urgent need for pancakes, or drop biscuits, or banana muffins. Find your box of Bisquick and then mush up the bananas with a fork. Now mix everything together in your mixer until it is just combined, which takes about 5 minutes from start to finish. Then you can either use mini-muffin pans or regular muffin pans to bake ’em up. I sometimes use paper liners and sometimes don’t – just make sure you grease the pan first if you don’t. At this point you need someone reliable to lick the bowl. Your kitchen will smell beautifully of bananas, and all will be right with the world. It’s enough to make you buy extra bananas just to get some brown spots going. Now over to you – go bananas! Bake 15-20 minutes for large muffins, or 10-12 minutes for mini muffins, until golden brown. Remove from muffin pans and cool…but make sure you eat at least one while they are still warm! The perfect follow-up post to your homemade butter! We love banana muffins. I’ve just recently begun adding 1/4 cup finely diced fresh pineapple, and 1/4 cup shredded coconut (sweetened of course). It makes a what we call at our house, “Hawaiian Muffins.” Also, if you’re not able to use up the bananas before they are beyond use, you can just pop them into the freezer (with the skins on), allow them to thaw on the counter or defrost them in the microwave, and use them as you normally would in muffins. Also, our dog would like to know if you’re willing to adopt her? I’ve never let her lick out a peanut butter jar or a mixing bowl. She’s devastated. We totally have bisquick somewhere in this apartment. And ALWAYS have brown bananas somewhere. Making these! Hurray! Just be forewarned…once you start making ’em, you can’t stop! Whoa – that sounds AMAZING! I really do need to get me some Nutella. What’s the difference between Bisquick and self-rising flour? Is there one? I know I use Bisquick for pancakes sometimes, but could you follow those package directions, but use S-R flour instead??? I almost always have the flour, but not always the Bisquick (since my college days of Bisquick pizzas made in an electric fry pan went away ;). Made ’em this morning. I grew up in Virginia, so impossible to consider having a pantry without a box of Bisquick! I like how quick they were, and the mild sweet flavor was also a hit with my family. This recipe is simply amazing. My whole house smelled like banana sugary goodness :) Every my Mom who doesn’t like banana’s love these muffins. I added a personal touch though ;) I added some ground cinnamon and honey. It just gave it the perfect touch. Then once out of the oven and warm I cut in half spread with butter then drizzled some honey and cinnamon. Delicious! I would say use more or less cinnamon or honey based on your preference. I use a little bit of milk and half of cup of chocolates chips too! When i bake them without chocolates Hersheys kisses the kids can tell and ask for the “real” Banana Muffins, I just ran out :(. Oooh, chocolate chips! Great idea! I love making these but have been using too much oil. Our 33 year old son will be visiting and wants them right when he gets here:). My daughter is the exact same way! I LOVED the recipe..but I did add vanilla, cinnamon and a few chocolate chips. Wow, it is a keeper!! These were easy to make and great to eat! Followed the recipe but added cinnamon, vanilla and pecans! Mixed by hand so there were little pieces of banana in the batter. Tried this recipe, I was intrigued by the convenience. Will never make again, texture was more tea-bisquity, and the taste of the mix drowned out the banana flavour. It’s not much extra work to take out flour and baking powder, and rather than wasting 3 good ripe bananas, will do it the old-fashioned way. Hi Rita! Well, I’m glad you tried them – I know Bisquick is not for everyone. And now you have inspired me to make an old-fashioned banana muffin recipe! :) Hope you have a wonderful day!